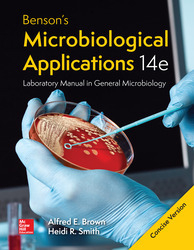 - Benson’s Microbiological Applications Laboratory Manual has been a gold standard in microbiology laboratory manuals for over 35 years. - Now in its 14th edition, the laboratory manual features new updates to encourage even more student engagement and critical thinking to the lab. - In revising the manual for its fourteenth edition, the authors worked hard to provide today’s most efficient procedures and further enhance the proven strengths this laboratory manual has to offer.